With better blacks and more overall usable brightness, this TV would rule its class, as it’s the only 120Hz panel we’re aware of anywhere near this price. But when it comes to HDR, the H9E Plus can’t match some of the brighter competition. 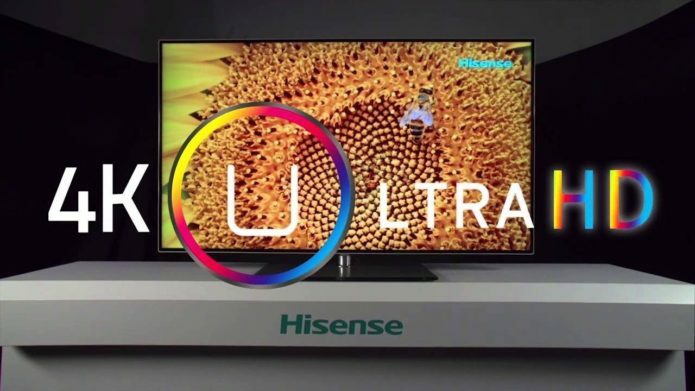 There’s a whole lot to like about 55-inch, $700 Hisense H9E Plus. Its motion handling, color saturation, and adcuity are all above average for its class, and it has a very nice-looking, thin-bezel design. The H9E Plus’s old-school 400 nits of brightness, however, means HDR doesn’t pop the way it does on some competing TVs, and the edge-lit backlighting doesn’t perform as well as the direct array backlighting of some similarly-priced competitors. In short, its blacks aren’t as deep as some of its competitors. Regardless, there is something appealing about the overall design, as well as the picture with the majority of material. The staff here preferred the image of the H9E Plus on many of our test videos. 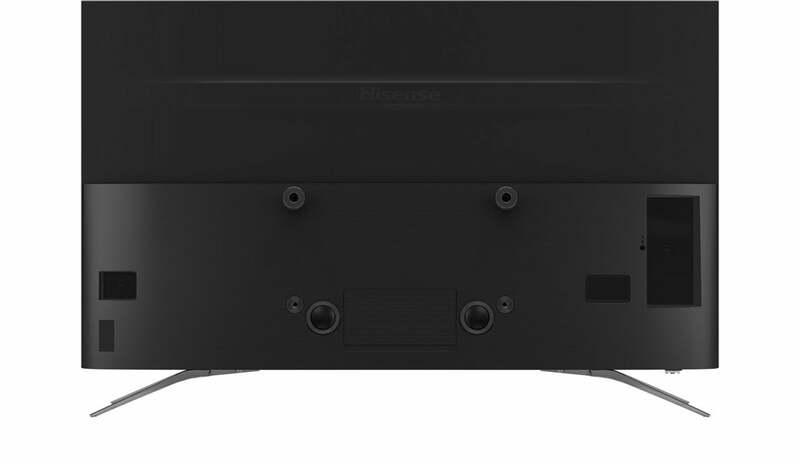 The H9E Plus is a semi-thin design TV, meaning it’s thin up top, but much fatter at the lower portion where its I/O ports are. The model we tested sports a 120Hz, 3840 x 2160 (4K UHD/2160p) 55-inch class (54.9-inch) display. A 120Hz refresh rate is unusual at this price point, and likely has a lot to do with why the TV handles motion so well. 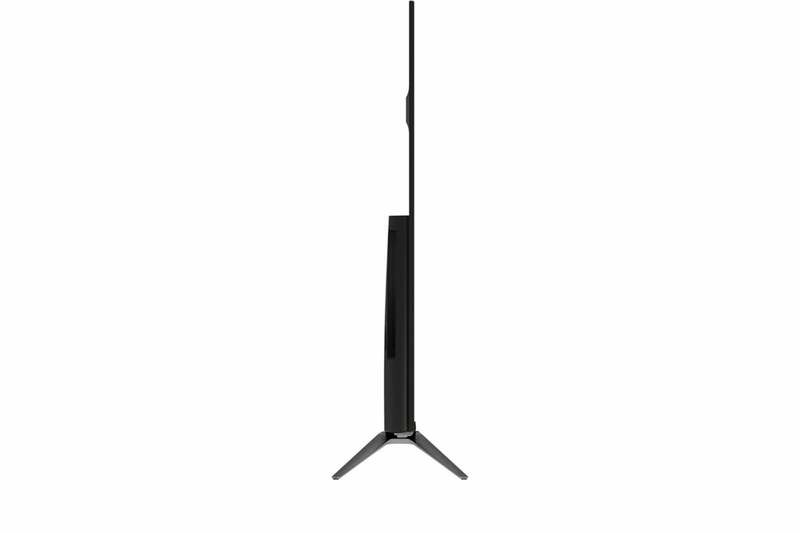 The H9E Plus weights approximately 42 pounds without the stand (there is also a VESA mount point), and is just over 43 pounds with it. It’s also one of the nicer-looking TVs to pass our portals, with its uber-thin top and bezel design endowing it with what’s best be described as an air of class. That’s a subjective opinion, of course, but most of us who saw it agreed. The thin-profile H9E Plus looks good from just about any angle. The Android TV interface the H9E Plus offers has improved quite a bit since the first time I laid eyes on it in a Sony TV a year or three back. It’s now much cleaner and much less tedious to navigate than the previous endless field of icons. My favorite change is that the input selection and settings are now always available at the top of the home screen, instead of buried several rows down. It also no longer crashes or hangs while enumerating test files. Put another way, Android TV is not something I consider a drawback anymore. Of course, Android TV offers the most perks if you sign into your Google account, which provides personalized search optimization and access to all your Google “stuff.” For the sake of you the reader, I actually did so for a couple of hours, before returning to my usual low profile online. If you’re an Android user, the interface and app store are major perquisites. 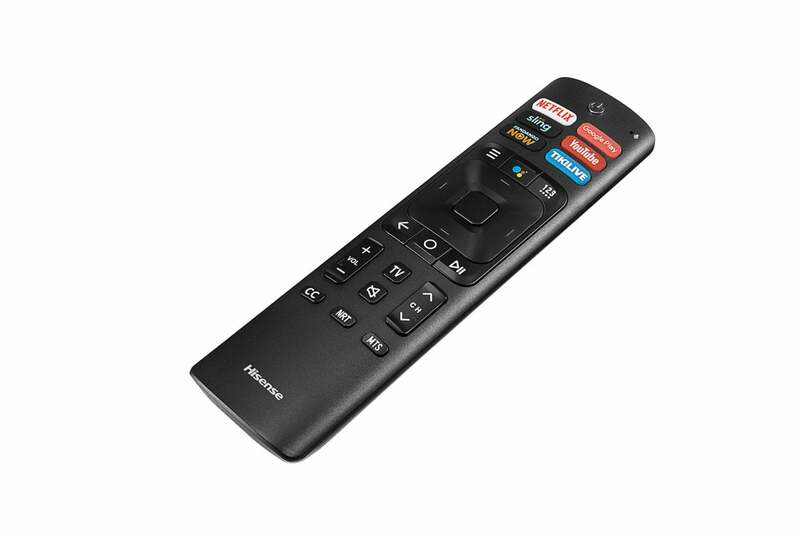 Hisense’s remote control is relatively efficient, erring on the side of fewer buttons. The H9E Plus features Google Assistant and it also supports Alexa devices. The H9E Plus’s remote has just the right number of buttons (according to my taste) and is easy to use. I found its cursor and select buttons, on the other hand, to be poorly delineated, both visually and physically. I wasn’t terribly in love with the somewhat large rocker control and entry button, and in dim conditions I found myself continually hitting the wrong button. I also am not a fan of the advertising shortcut buttons (for Netflix, YouTube, et al). Some will find those shortcuts useful. I don’t. Being the most obvious buttons on the remote, they continually draw the eye when you don’t want them to. But who knows? If you use these services frequently, you might love having them presented front and center. 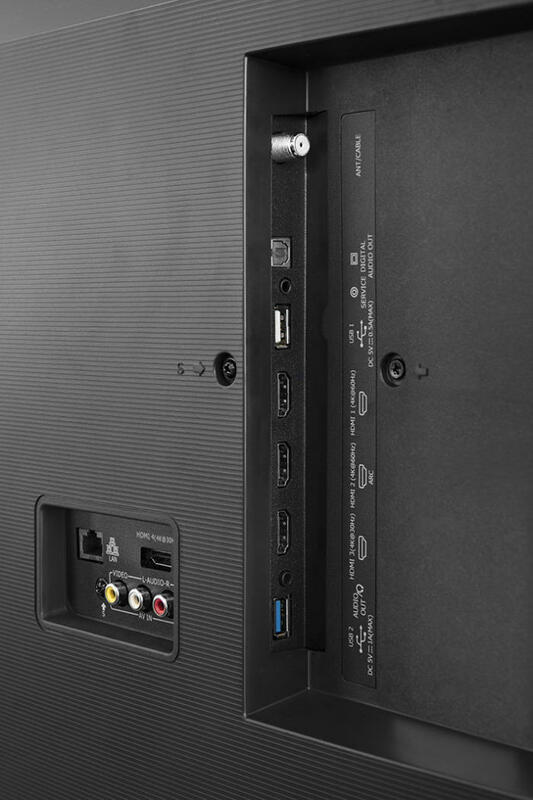 The I/O port collection on the H9E Plus is sufficient, if not particularly forward thinking: There are four HDMI (two 30Hz and two 60Hz) ports; one USB 2.0 and one USB 3.0 port; optical audio out; 10/100 ethernet; and an 1/8-inch stereo audio output. There are also RCA stereo audio, composite, and S-video inputs, as well as a coax jack for cable or antenna feeds. An onboard 802.11ac Wi-Fi adapter is also provided. Only two of the H9E Plus’s two HDMI ports are 60Hz, though that won’t affect anyone but videophiles, who are also more likely to buy a much more expensive TV. I was impressed with the H9E’s overall picture at the outset of testing,and I still feel it’s very good with the vast majority of material. Colors are nicely saturated and generally accurate; greens drift a tad to the lime, but red and blue are both quite natural looking. But the highlight is the motion handling (smooth action shots and pans) which—thanks to the 120Hz panel—is comparable to a much pricier TV. Note that it is possible to get smooth action from a 60Hz set if you throw enough CPU power at it, but I’ve yet to find a 60Hz TV that does. Those 60 extra frames per second really make the chore easier. 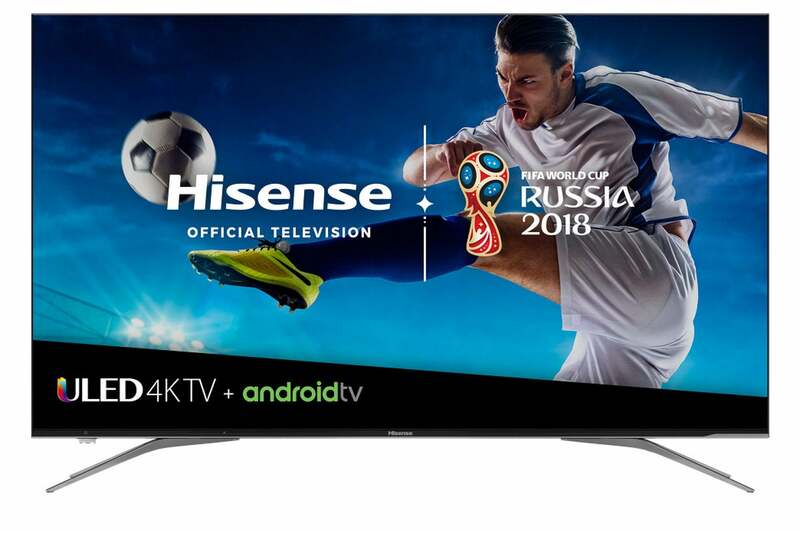 Good job, Hisense. 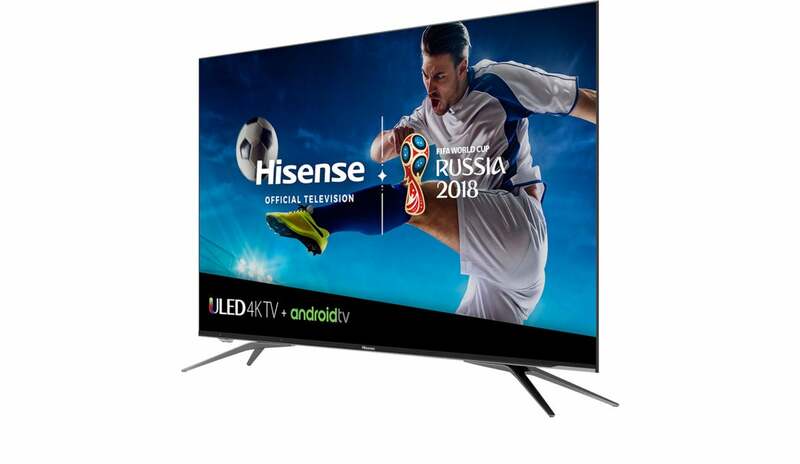 The Hisense brand name was in great evidence at the recent World Cup. The company makes great mid-range TVs. The H9E Plus did suffer the tiniest amounts of moiré and shimmer in high-detail panning shots, (even, unusually, in the store demo), but all-in-all it was significantly less prone to those artifacts than the similarly priced competition. You could spend a whole more and not do better. Where the H9E Plus started acting like a $700 TV was when the scenes got dark and I started watching HDR programming. In my testing, the set generated only around 370 nits in its brightest areas with the standard settings—a good 300 nits shy of what’s considered the minimum to make really HDR pop. Even with the backlight and brightness cranked, the H9E Plus only managed 420 nits. You won’t want to crank the H9E plus even a little as the already not-so-blacks will turn light gray quickly. There are a number of other adjustments available, including white balance, gamma, hue, saturation, and so on for those who like to play with such things. I was never able to find a combo I liked better than the defaults. Dolby Vision helped with the HDR a bit, as does the fact that the H9E Plus is a 10-nit panel with a fairly wide color gamut, but the HDR just doesn’t pop as much as I’d like. The H9E Plus might not be as bright as some other TVs, but it still delivers a nice picture and uses less power than 1,000-nit HDR TVs. There is an upside to lesser brightness that I haven’t talked about much recently, and that’s energy savings: Some TVs crank out 1,000 or even 2,000 nits and top out at 300 watts during very bright scenes. That’s way more than is accounted for in those yellow-tag cost-per-year estimates pasted on TVs. Way more. The H9E Plus topped out at around 130 watts. The H9E Plus is edge lit, which has a lot to do with the lesser background, and we also noticed the occasional backlighting artifact, such as haloing around neon signs on a night sky. Rather large and obvious halos to be honest. As I said, blacks are not this TV’s strength. The sound emanating from the H9E Plus was—passable. It’s all rear-firing, so the surface behind the TV will make a big difference. Put another way, it will do until you plug it into the stereo or a buy a soundbar. One thing I forgot to mention about Android TV is that the media app is now a lot quicker at reading files from a USB disk, and it did a pretty bang up job playing all our 2160p and other content. It also supports 5.1- and 7.1-channel surround in the files (most major types are supported via HDMI), which is somewhat rare. 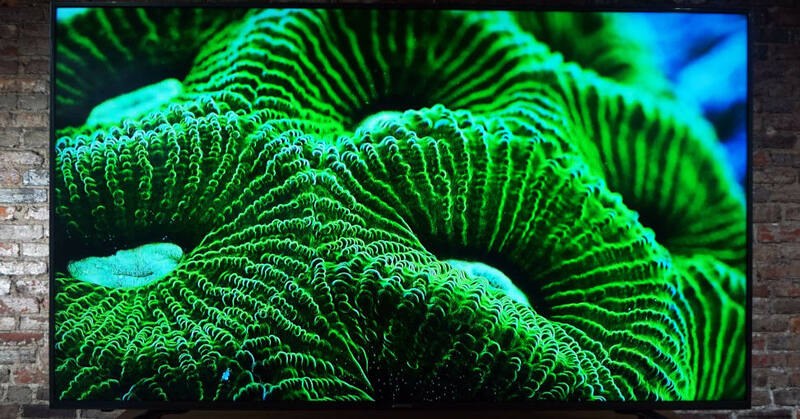 A thin-design, 55-inch, 120Hz, Dolby Vision TV for only $700 is pretty sweet. The H9E Plus viewing experience is super smooth and is quite good overall. It’s also a very nice-looking TV with a thin bezel; and the revamped Android interface will be a selling point for fans. But the blacks aren’t great and the overall lack of brightness makes the H9E Plus’s HDR renderings considerably less striking, albeit smoother, than some of the competition from Samsung, Vizio, and TCL. You can’t have it all at this price point, so take your pick—smooth or bright.